Lemax New Holiday Hats Figurines Set of 3 depicts two well dressed ladies assisted by a young man carrying the ladies new Christmas hat boxes. A new Lemax figurine set which joined the Lemax Village collection in 2018. 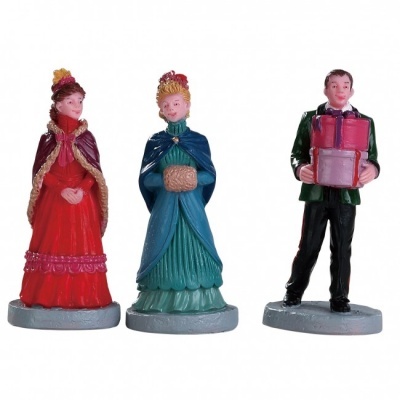 New Holiday Hats presents 3 individual hand painted polyresin figurine pieces on 3 bases in wonderful miniature scale, to compliment your seasonal Lemax Village display.